Click on the badge to be linked to the site! I am pleased to announce that we are launching a new exciting program that we hope you’ll enjoy. The program is called Hi Mama. 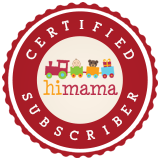 What is the Hi Mama program? HiMama will be used by our teachers to record activities on their tablets (iPads) as they happen throughout the day to keep you informed on everything from nutritional information to fun moments and learning activities. It will provide you with real-time email updates and access to a complete history of your child’s experience in our program with photos stored safely and securely in a journal format that you can access from home or through mobile apps. HiMama will keep you informed by providing you with digital updates on your child to complement our important face-to-face interactions. It’s also a great way to reinforce your child’s in-program learning at home as you’ll have timely insight into what they’ve been working on throughout the day. Updates can be sent via email to the parents of the child. If you would like to provide us with a recent email address for you or your spouse, please send this information to me at your earliest convenience. You can expect to receive an invitation from HiMama in the next few days. At this point many of you will likely want to create an account so you can access the history of your child’s activities and add your own milestones, in addition to receiving the email updates from us. If you want to share updates with additional family members, you can also do so once you’ve created an account. If you are interested in learning more, you can visit the HiMama website @ www.himama.com or simply click on the HiMama badge at the top of this page.